“I didn’t say I was different or better. I’m not. Hell, I sympathize; I sympathize completely. Apathy is the solution. I mean, it’s easier to lose yourself in drugs than it is to cope with life. It’s easier to steal what you want than it is to earn it. It’s easier to beat a child than it is to raise it. Hell, love costs: it takes effort and work” Somerset, Seven. Life is tough, get on with it. You are not here to whine about it and no one has time to listen, you want to be mediocre go ahead, let this web of events you call life take you where it wants. If it’s not winning you are here for then you are just losing. You lost your daughter to child care services, better rebuild yourself and train harder than you ever did, make it through the cracks and get back on your feet for that last fight to win back your daughter, it’s not always simple I know, but maybe just maybe it is not meant to be simple. And just to let you in on a little secret, you don’t need to be born with superior genes, no need to be nurtured to your best qualities, sometimes winners come from foster care homes with no one to take care of them but themselves, so they learn to trust themselves, they learn to try and they set their eyes on the prize, then they learn to fail then they even get used to the bitter sweet taste of defeat and they always believe in not giving up, giving up is not an option. We all need tough love sometimes, people who point out what’s wrong rather than just let it go, who will let you know that it takes efforts to make things work,that it feels like you lose a piece of you every time you fail, but you will always come up standing on the other side. 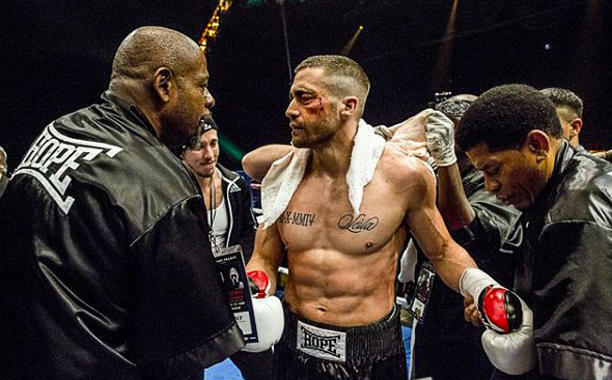 P.S: if you are at the cinema looking for something to watch, go for Southpaw.